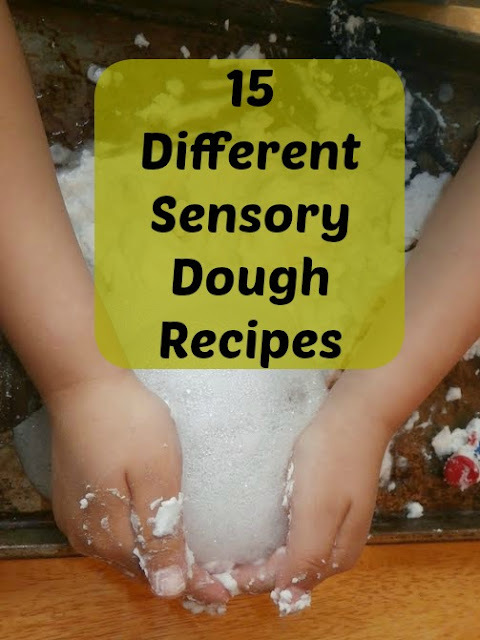 My kids love playing with play dough, slime, goop, and making new types of dough. There was a time we were making something new just about every week. There's something about watching two or three ingredients combine that just fascinated them. Sometimes our dough "experiments" failed but usually we had something new to play with and the joy lasted for several hours or days. Now that the kids are older we don't make dough as often but we still enjoy making something when we're bored and looking for something out of the ordinary to do. 1. Beach dough-- This one smells like the beach and reminds us of summer! It was the easiest to make too; one box of cornstarch and 1 bottle of Suave Ocean Breeze conditioner and enough baking soda to stiffen the dough up (this varies depending on how much conditioner you actually can get out of the bottle). The great thing about this recipe is using a different scented conditioner will get you a different dough. Studying apples?? Make apple dough. Planting strawberries?? Make strawberry dough! The possibilities are endless and the conditioner in the dough leaves your hands nice and soft afterwards. 2, "Fluffy Stuff"-- that's just what we call it! We mix two boxes of corn starch and two bottles of shaving cream to make enough for all three boys to play with. Caution: this one is a messy one! I found cornstarch everywhere when we were done. However it was lots of fun and totally different sensory experience. 3. Foamy Sand-- Put 3 cups of sand into a large bowl or container and mix in one container of shaving cream. Just keep mixing and adding more shaving cream until you like the mixture. 4. Fake Snow- 6 cups of Baking soda and 1 cup of hair conditioner (any type of conditioner is fine but it must be white if you want it to look like snow!). This dough stays cool to the touch too! 5. Goop- Cornstarch and water. That't it. Just add equal amounts of water and cornstarch and mix. To make colored goop add food coloring to the water before stirring in the cornstarch. Don't be afraid to experiment either. We've used paint water and cornstarch for a bright goop. We've added pop rocks candy into the cornstarch before adding the water for "fire cracker" goop. 6. Cloud Dough-- Mix 8 cups of flour with 1 cup baby oil. We've made sparkly cloud dough by mixing in glitter too. 7. Silly Putty-- Mix equal parts liquid cornstarch and Elmer's school glue together. If you'd like colored silly putty add some food coloring to the school glue before adding the starch. It's pretty simple but requires quite a bit of mixing and stirring. I prefer to wear disposable laytex gloves and kneed it with my hands. If the mixture is really sticky and I can not get if off the gloves I add just a bit more starch to the mixture. If it seems stringy and will not firm up I add just a bit more glue to the mixture. 8. Slime-- A single batch uses 4 oz. clear school glue. Mix Elmer's glue and food coloring in a bowl. In a separate container dissolve 1 tsp Borax in 1 cup of HOT water. Let it sit for a few minutes and then add to glue mixture while stirring. You'll see it start to firm up immediately. 9. Lotion Dough-- One day the boys wanted to make our Fake Snow dough but I was out of conditioner. Always looking for new ways to make something fun we tried making the dough with a bottle of lotion instead. It was a bit runnier and didn't stay as cool feeling but I loved that the lotion dough served double duty keeping my middle son's hands moistened. He has such bad eczema in the winter and just hates to use lotion but he was willing to play with this dough. We just adjusted the amount of dry ingredients until we had a consistency we enjoyed. 10. Foam-- by far the easiest "dough" ever! We took 1/3 cup of water and a squirt of dish soap and put it in our food processor on high until the foam was all the way to the top (a blender would work just fine too!). You can add food coloring for fun colors too. Best way to play with soap and water EVER! 11. Flubber-- It feels and acts just like silly putty but it's made like Slime; Using regular school glue mixed with food coloring and a bowl of hot water and Borax you combine the two mixtures and get a fun dough. 12. 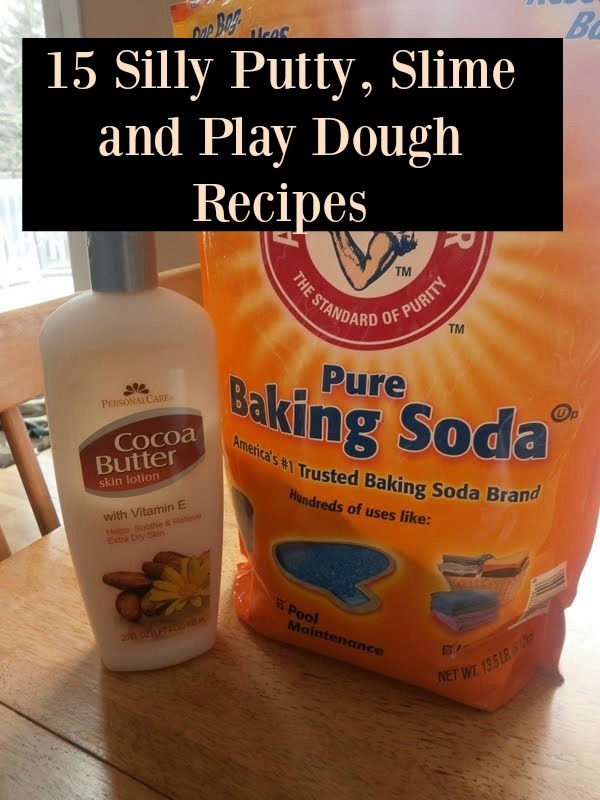 Fizzing Dough-- Any of the dough recipes above made with lotion or conditioner with baking soda can make a wonderfully fun fizzy dough with the addition of a little vinegar. My kids spent hours one day turning our lotion dough into fizzing dough using droppers and a mug full of clear vinegar. 13. Kool- Aid Dough-- Using a packet of unsweetened Kool- Aid mix with Baking Soda and slowly add water until you have a good dough- like consistency. If you add too much water it will be runny and not a good dough but you can always add more baking soda until you get the right consistency. For brighter colors you can add food coloring too. 14. Moon Sand-- 4 Cups sand, 2 cups cornstarch, and 1 cup water. Mix all ingredients together in a large bowl until well combined. If dry add a bit more water, if wet you can add a bit more cornstarch. I saved this for last because I HATE making dough that needs to cook on the stove. I like quick and easy and I don't find doughs that I have to cook to be that easy or that quick. 15. Jell-O dough-- 1 cup flour and 1/2 cup extra, 1 cup water, 2 TBSP salt, 2 TBSP cream of tartar, 2 TBSP vegetable oil and 1 3-ounce package of Jello. Combine all ingredients in a non- stick sauce pan (except for the extra flour) and mix well. Once it's all mixed together heat over low heat until a ball of dough forms. It takes time; you have to cook off all the liquid and you need to stir it pretty much constantly. Once the dough is formed turn it onto wax paper or foil to cool. Once cool to the touch it's safe to play with and then you can store in an air tight container for a few months. who knew that there were THAT many types! Thanks for all the info! My girls love Play Doh - in fact I think we will get it out today! You're welcome! It sounds like your girls are in for some fun today. Our favorite is the hair conditioner and baking soda. We love how cool it feels to the touch. 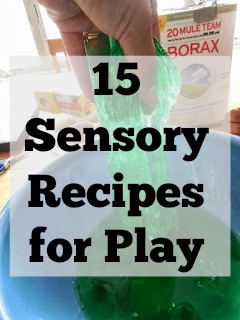 That looks like fabulous sensory play! I need to find somewhere that sells Elmers glue and liquid starch here in Scotland! I'm also write about how to make slime with glue please give me a feedback for this slime making recipe. Thanks! We have made slime with glue, water and Borax too; your recipe looks great. Wow I didn't know there were so many! I used to make them with my kids. It's such a fun experience for them! It is so much fun; I'm kind of bummed that mine have outgrown this stage.